Today I want share with you a biblical perspective on how we (believers of the Bible) should handle our finances. I also want to do a comparison of how we’ve always been taught by the world’s system to handle our finances, verse God’s way of handling our finances. I will also expose the truth about debt from a Biblical perspective. I must warn you that if you have been living with credit cards, and getting loans for everything you own and paying monthly payments on your possessions, this is going to shake your confidence because what I am about to expose you to right now, probably goes against everything you’ve been taught and everything you know about money and debt. It takes having real trust in the Heavenly Father to handle your money the Biblical way, verse the world’s way. You will find out that when the rug is pulled out from under you, and what I mean by that is, when all of your options are taken away from you to use other people’s money to fund your material possessions and your dreams, that your security has been in the world’s system and not in God’s system. True financial security comes when you owe no man but to love him, false security comes when you are a slave to the lender and have borrowed the lender’s money to fund your dreams or your possessions. I want you to know this blog post is all about me as well, I don’t get a pass. I was hesitant to release this blog post because I didn’t want to sound like I had it all together. My husband and I are still working towards handling our finances the way the Bible instructs us to. It’s hard and tempting, going back and forth and dancing with what the world offers you, verses taking a stand to handle your money God’s way. I am not judging you and I do not have it all together, but my husband and I are working on a better financial future. I have been released to release this blog post, in the hopes of getting believers of the Bible to see the truth verses a lie on how we been taught to handle our finances. Just because the world deems it normal to take out loans of every kind, apply for credit cards, make vows, pledges, give money and possessions without truly looking at all the other bills you owe or counting up the cost, do not make it the Biblical thing to do. We live in a country where debt is supreme, but what I am learning from a biblical perspective is that Cash is King. If you do not have the money in your possession to fund it, then you save up for it and pay cash or you live without it, or God will bless you with it through someone else, instead of becoming a slave to the lender and borrowing it. Now I know we are taught about good debt and bad debt, like borrowing money to fund your degree, a home and business but from a Biblical perspective all debt is bad. I know most people have no other option but to borrow funds for their schooling, home and business, it will help put them in a better financial situation. But even in these cases, you are still a slave to lender until you set yourself free from the snare of the fowler, you are not exempt, neither are you the exception to the rule when it comes to handling your finances the biblical way. Any debt from a biblical perspective is being a slave to the lender. This article is only talking about what the bible has to say about money. Now I love Dave Ramsey philosophy about money because it comes from a biblical view and after listening to his talk on money, it is a goal of mine to adopt a biblical perspective on how I handle my finances. Now let us dispel, expose and learn some truths about money from a biblical perspective verses the world’s perspective. Click this link to learn 250 Bible verses about money. 1. Debt : a state of being under obligation to pay or repay someone or something in return for something received : a state of owing deeply in debt to creditors. The world offers us so many ways to get ourselves into debt, like credit cards, car loan, mortgage loan, business loan, payday loan, furniture loan, appliances loan, co-signing for some one else’s debt, making pledges, student loan, banks are offering a program where you can borrow against your own money therefore making you in debt to yourself while they are making interest off of your money, and if you forfeit the rules that they established for you to borrow against your own money, your money becomes the bank money and you loose your money to the bank. Leasing cell phone, borrowing money from friends, families and foes. It is so easy to get into debt. Now let’s read what God thinks about all of this, put your seat belt on, you are about to see things in the word of God that you probably have never seen before. For the Lord your God will bless you as He has promised you, and you will lend to many nations, but you will not borrow; and you will rule over many nations, but they will not rule over you. The Lord will open for you His good storehouse, the heavens, to give rain to your land in its season and to bless all the work of your hand; and you shall lend to many nations, but you shall not borrow. God said, when we are trusting in him and live our lives after his ways, He would bless us and we will lend to many nations, BUT YOU WILL NOT BORROW, we will rule over nations, but they will not rule over you. God said he will open up his good store house, the heavens, to give us rain to our land in its season, and to bless the works our hands, and you SHALL LEND TO MANY NATIONS BUT YOU SHALL NOT BORROW! Now tell me, how are we going to be lenders, if we are borrowing other people’s money? We have disqualified ourselves from this scripture when we borrow money because God’s tells his people that they will lend and not borrow, this is our covenant right with God. Every time we get ourselves into debt we forfeit this covenant. Anytime you take on a loan, borrow money from someone or make a vow to someone to give them something, whether you’ve signed your name on the dotted line by saying you are going to pay this money back or you’ve entered into an oath or agreement or a pledge with your mouth, you have now become that person or institute slave! They now rule over you, from this scripture they are the ones that are rich, now you are the one who is poor because you did not have the cash in your hand or in your bank account to pay for the items you wanted at the time the full amount of payment was needed. The Bible has a lot to say about a person who borrows money from others and do not pay it back, the Bible cause that person wicked! The wicked borrows and does not pay back, but the righteous is gracious and gives. If a man borrows anything from his neighbor, and it is injured or dies while its owner is not with it, he shall make full restitution. We live in a time where people words have lost it’s power, now you have to get things in writing. Years ago you can do a handshake and believe what the other person tells you when you loan them money, clothing and your car etc. As believers, the Bible tells us if we borrow anything from anyone, and it gets damaged, lost or stolen, we are to make full restitution of what we borrowed. If we do not make good on the word or our vow, we are considered wicked! Lets look at what the scripture say in the Bible about making an oath, pledge or a vow. Proverbs 17:18 ISV A man who lacks sense cosigns a loan, becoming a guarantor for his neighbor. 1. a formal or solemn promise or agreement, esp to do or refrain from doing something. 2. collateral for the payment of a debt or the performance of an obligation the condition of being collateral (esp in the phrase in pledge). 3. a sign, token, or indication: the gift is a pledge of their sincerity. This is the only thing from scripture that a follower of Christ is suppose to owe a person. The world sends us messages, mail and even encourages us to get into debt. They make it so easy for us we to qualify for a loan to purchase the things that we want. They don’t care about your previous history of filing for chapter 13 and your poor credit history. They have created programs designed just for people with a bad money history. Colossians 2:8 ESV See to it that no one takes you captive by philosophy and empty deceit, according to human tradition, according to the elemental spirits of the world, and not according to Christ. God is telling us follow his ways and not the ways of the world! Matthew 5:33 ESV “Again you have heard that it was said to those of old, ‘You shall not swear falsely, but shall perform to the Lord what you have sworn.’ But I say to you, Do not take an oath at all, either by heaven, for it is the throne of God, or by the earth, for it is his footstool, or by Jerusalem, for it is the city of the great King. And do not take an oath by your head, for you cannot make one hair white or black. Let what you say be simply ‘Yes’ or ‘No’; anything more than this comes from evil. James 5:12 ESV But above all, my brothers, do not swear, either by heaven or by earth or by any other oath, but let your “yes” be yes and your “no” be no, so that you may not fall under condemnation. Lets sum it all up. From these scriptures the Bible says do not make an oath, vow or pledge. When you do, it is not of God or comes from God. It is not wise. Let your yes be yes and your no be no. Anything other than your yes or no, comes from the evil one. If you have the money in your hand or bank account give it or buy it. If you don’t, do not entrap or enslave yourself by making vows, oaths or pledges. If you owe anyone or made a pledge pay your vow, or you would be considered wicked! Would love to here from you, feel free to contribute your thoughts on this topic. Follow me on social media by clicking the tabs at the bottom of this blog post. Click this link to follow me on Instagram. 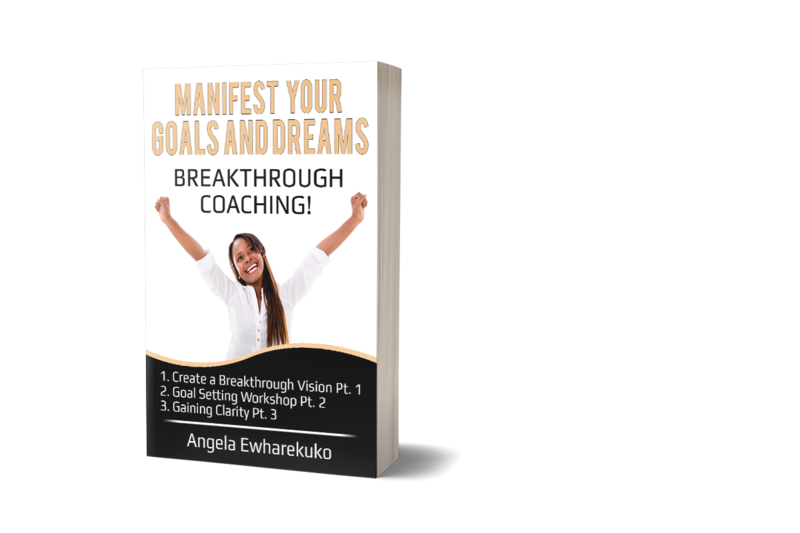 My Name is Angela Ewharekuko, also known as Coach Angie. I am the Founder of No Boundaries Breakthrough Blog which was birth out of a desire to see women and girls have a relationship with God, own and walk in their authentic power, live in their brilliance, find their voice, connect to their genius, live on purpose, profit from their passion and live a happy and fulfilled life. Women it is time for you to arise! It is time for you to create the life you were destined to live. God created me to partner with him in helping women and girls recognize their brilliance. He wanted you to know that you can create an amazing, confident, happy and beautiful life. It doesn't matter what happened in your past, you can start right now creating a beautiful life for yourself. A life where you wake up happier everyday. A life where you are truly loving and enjoying your responsibilities as being a beautiful confident extraordinary woman, wife, mom, domestic diva, businesswoman, teacher and an influencer. But in order for you to create this beautiful life, You have to be your own advocate! There is a warrior aspect of being happy but you have got to fight for it! Let me help you to breakthrough to a happy beautiful life! I am a Christian, wife, a mother of 5 and I have 1 granddaughter. I talk about all things relating to women and girls. Some of the topics of discussions are; Breakthrough to a Better Life: self care, speaking life, people pleasing, working out, healthy eating, journaling, love list and more Breakthrough to a Bigger Dream: purpose, passion, visualization, vision boards, goals, abundance mindset, journaling, faith, belief, authenticity, networking, branding, fears, marketing, ask for the sale, discipline, Breakthrough to a Balanced Home: parenting, schedules, meals, clearing the clutter, cleaning routines, atmosphere, discipline, management system, vacations, chores and more. Breakthrough to a Peaceful Homeschool: curriculum, encouragement, schedules, removing clutter, field trips, co-ops, time management, multiple children, meals times, extra curriculum activities, room tour, organization, teaching style, your best homeschool tools, daily routines and more. Breakthrough to better marriage: love, unity, faithfulness, boundaries, communications, intruders, romance, date night, support, encourage, forgiveness, loyalty, respect, cherish and more. Breakthrough for the Unmarried Lady: purpose, focus, self-care, declare your season, sanctification, forgiveness, enjoy your company, toxic relationships, emotional baggage, love list, journaling, removing clutter and more. THE POWER OF LETTING GO! A key element in manifesting anything in your life.